Tells the story of Grace Jarrold who lived for 90 years in the Devon village of Plympton. Following the lives of Grace and her family, it traces the social changes through two World Wars, the decline of farming, and the ten-fold expansion of the village, now absorbed into Plymouth. Spent the first two years of his life in India and the next sixteen in Cornwall and Devon. Fluent in Russian and described as an ‘enthusiastic Russophile’, he is working on a book about the effects of Bolshevism on Russia and Communism on Great Britain. He also writes short stories and poems. A beautiful and moving personal tale - given how intimate and personal a portrait this is, it is surprisingly universal and relevant. I thought it was even better than the author's previous book, Stranger on the Shore, which I've bought as presents for several friends/family members. A simple but affecting telling of a close relationship. 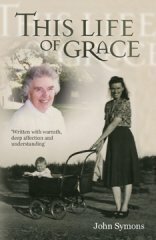 Grace was someone who would otherwise have left little trace. She is reborn through her son's loving kindness. A well written and deeply moving book.